Going on Week 7 -- Dealer or MBUSA engineers dont know why it wont start -- Loosing faith in "German Engineering"
1-All right, till after I switched it off, get out of shopping mall=No start. 2-The whirre-sound when the key is inserted, was missing, no sound, key can be turned, but nothing further. 3-jump made no diff, light shined bright, not battery. It took the dealer two days to confirm EIS after I made such a statement upfront to them. Waited two weeks for episode to play out. New EIS=Sounded faster and fresh. The old one always sounded slower. Hey all - I seem to be having the same problem. Last friday I went into my car and the damn thing just wouldn't start. I called for an emergency boost and the technician basically confirmed that the battery was fine. Had to leave my car at work over the weekend because it was too late to get it towed. On friday I got home and put a quick note on the MB Canada facebook page and a MB facebook administrator replied and asked that I send them an e-mail directly and they would try to resolve. I sent the e-mail but have not heard back. I hope it works out well for me and for the rest of you that are having the same problem. Dealer said it was steering wheel lock failure.... told me if I had extended warranty it would be covered. $900 so far.... unless EIS failed, too. Then it will cost me $1700! This is my first Mercedes and I bought it because I thought they were built to last. Mercedes likes to brag about how they have taxi's on the road in Europe with a 1 million miles on them. I thought their engineering was superior. Well, when a car fails after 67,000 miles.... you got a problem. Depending on how this is handled will make or break whether I ever buy a Mercedes again or whether I am going to sell off this car as soon as its fixed. I probably will sell it anyway because I don't like "phantom" surprises that leave me stranded. Has anyone else been able to reason with Mercedes regarding this problem? There are other threads on this forum regarding this, too. I am extremely dissapointed in MB and how they have handled this whole EIS problem on this year/model car. I am going to pay the $1,269 and head over to trade my car in at another dealership. The cam solenoid harness campaign (NOT A RECALL) has absolutely no connection to an EIS failure since they are separate and unrelated components. Do not pay, there was a communication about the EIS, they should have replaced it on a previous service, I refused to pay. Here are the responsible management that should manup for the W204 problems, mistery however on how to contact them. Its time to go to the top. I understand completely that they have nothing to do with one another. However, even on Benzworld.org, people have claimed their dealers have used this campaign to fix their steering lock/EIS failures. I am an engineer for a large oil and gas equipment manufacturer so I'm not about to talk apples to apples but in my industry, aside from safety, quality is second to none. With a problem like this being so widely known from such a large automotive company, I would expect nothing less than for them to take ownership of "bad quality"..not the vehicle itself, but this particular issue. 6 Weeks ??? what MB Dealership is this ? Did they send it back to Germany ? As some stated in his comment : "I breathe a sigh of relief every time my car starts " woooooooooooow , what great depandable cars MB . In the old days, before these fancy ignitions I would read of people claiming having lots of keys on keyring caused strained. Could there be any truth to that now? I do not have even a keyring on my key. For those with failures, do you have a particularly heavy key ring with lots of other keys attached? I hope that what I have been reading doesn't happen to me. I own a 2008 C300 4matic. Bought it at a used car dealer two years ago. Love my car. Started my car no problem the other morning. Let it run for 10-15 minutes to warm up. Got in and realized I forgot something in the house, turned the car off to get back into the house. Came back out and tried to start. Nothing - no click, no unlock of steering wheel, no sound. Only lights on dashboard came on. I have roadside assistance on their way to check it out. How does a recall get started? Are there so many complaints they have to see before they do anything? I will post after they determine what the cause is, but I am scared that it will end up costing me a few thousand dollars. Well, I haven't seen people quote more than $1600 or so, but your situation might be different. I hope it all works out and perhaps it is simpler in your case. Let us know how it goes, your mileage, etc. Good luck! I have a 2008 C300 and yesterday I drove my car a short distance and turned the car off to run into the store, came back out and it would not start. Had to have it towed. Lights on dash came on, doors would lock and unlock, radio works but car would just not start. Does this problem occur on '09s as well? Can ANYBODY who has had their EIS/steering lock replaced please post invoice information? 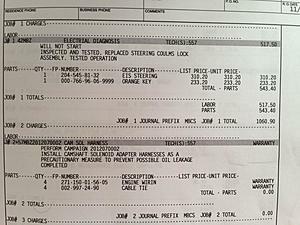 Part numbers and labor costs info would be great. Does anybody know if this is a repair MB Dealerships must perform due to specialized coding? Or in theory could we acquire part(s) and go else where. I would like to know too. If anything what is this covered under( engine, electrical, transmission). Gettting it done would this be a preventative measure too. 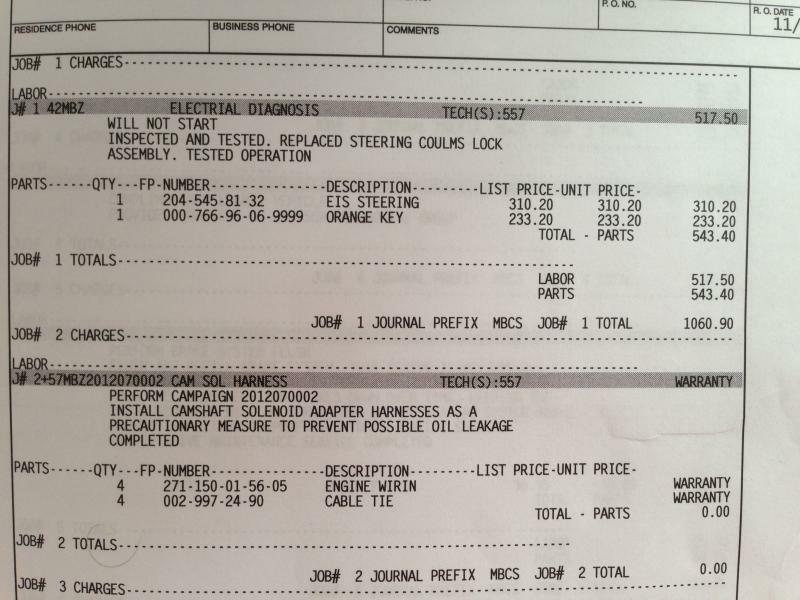 Here is a copy of the section of the invoice when mine was replaced back in November. I also wish they would do something about the click wheel for the Navigation system. The one in my car is not working and I understand this is another issue in 2008 cars that many people have. Thank you very much for taking the time to get that photo to! So with just an EIS failure the repair is around $1,100. I wonder why some dealerships report a steering lock failure in addition to the EIS failure. I am also curious is any new coding was necessary after install of new EIS and "Orange Key". Just happened to my 2009 c300. 77k miles. Dealer kept car all day and I called throughout the day for status and they couldn't figure it out. Finally at 6pm I get a call and they tell me I need to replace my steering lock - parts and labor $1365 (tax included). ^	When accessing the occupants compartment, the message center in the ICM will illuminate (note: eventually the message center will time out and shut down, and will not illuminate until the CAN is activated via the interior lock/unlock switch). ^	The key will turn in EIS N73. ^	The ESL N26/5 does not activate/respond (or the steering wheel remains unlocked at all times). ^	The warning icons in the ICM will not illuminate. First perform a complete guided test of the drive authorization system, and transmitter key via the "Tests" menu in the EZS control unit. Fault codes A25408 and A25464 in the Electronic Ignition Lock N73 (EIS/EZS) direct you to replace the Electronic Steering Lock N26/5. If no fault codes are stored, do not replace any parts! Check the part number on the Electronic Steering Lock N26/5. If the part number is A204 545 57 32, please replace with part number A 204 545 81 32 using WIS instructions AR46.10-P-0910CW. If the part number of the Electronic Steering Lock is A 204 545 81 32, please contact Dealer Technical Support; we would like to have the part shipped to us for further analysis. It is possible to corrupt the Electronic Ignition Switch N73 if it is replaced prior to replacement of the suspect ESL. Also, insure that the CAN does not time out before the programming of the ESL with the workshop key is completed. Daimler AG has determined that the EIS may malfunction preventing the electric steering lock and the central locking from functioning. Dealers will replace the EIS on the affected vehicles during the next workshop visit. ^	Please check VMI to determine if the vehicle is involved in the Campaign and if it has been previously repaired. ^	Please review the entire Service Campaign bulletin and follow the procedure steps exactly as described. Approximately 10 vehicles are affected. ^	Use DAS 02/08 with all associated patches or higher. ^	Follow the steps exactly as described in DAS. 1. Connect Star Diagnosis to the vehicle. 2. Transfer the settings of the EIS control module to Star Diagnosis by navigating through the following screen menus: Main Groups/Control Units/Body/EZS - Electronic ignition switch/Initial Startup (follow on-screen instructions). 3. Replace EIS, refer to WIS: AR46.10-P-0810CW. 4. Continue with Initial Startup (follow on-screen instructions). I Just had this fixed on my '08 C350. The fix is to replace the module in the dash that reads the key. The cost $850. I'm about ready to sell this thing.